“If my pet doesn't like you, I don’t like you”. This, is the philosophy of all dog owners and cat people. Pets are such an integral part of life, aren't they? Yours truly, in fact, has been begging her mother to let her have a pup but no, yours truly's mother doesn't want to take care of it. In her own words, "I have three kids, I don't need a dog". Okay. So today, I thought I will let you guys know about this amazing portal, timeforpet.com. This start up is for you to adopt pets. 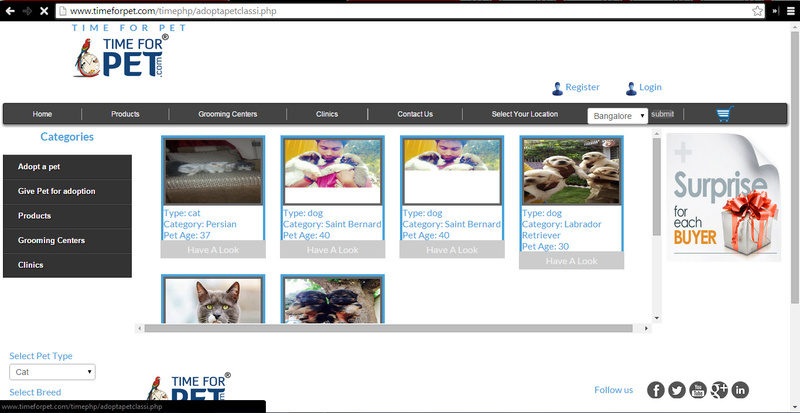 Yes, an e-commerce site that lets you adopt pets, put up pets for adoption and also provide you access to all things pets related. Time For Pet is the brainchild of five friends. 1. Head over to the link above and have a look at pets that are up for adoption - dogs, cats, birds and fish. 2. Loved a fellow? Get all details right from the page. Fill your details in the registration form. Time for Pet sources the pets from all over the country - they have tie ups with kernel clubs across the country and beyond too. If you are unable to take care of your pet for some reason and want to put him up for adoption, you can get in touch with the team. Currently, Time for Pet receives 2-4 requests for dogs everyday. As of now, there is no logistic support provided. “When it is required, we use air transport in order to keep the pets safe and to fasten the process. But the charges are directly paid by the person adopting the pet,” explains Nirneeth. Adorable, know? Apart from finding homes to pets, Time For Pet also has a fabulous initiative going on for street dogs. Through their scheme called I-Breed, they promote the adoption of street dogs and also provide free home delivery to customers that purchase street dogs. Time for Pet has received 28 requests for the I-Breed so far, with 10 being from expats. Like I mentioned before, Time for Pet also stocks on pet food and care products. They deliver these to any part of Bangalore within three hours. Currently, the focus is on Bangalore, Hyderabad, Chennai and Mysore. The website is also super helpful and lists directory of vet clinics in different areas and also has a veterinarian’s advice page for free advice on pet care. You can contact these awesome entrepreneurs on the number here : 8971627667. You can also connect with them on various social media platforms listed on their website. I rarely ask you guys to share a post, but this? Please do :) You might help a pet find a happy home. Or take one to yours, may be. PS: This is not a sponsored post, just a topic that's dear to me.